Wouldn’t it be great if you knew a place with delicious meals for breakfast and lunch, accompanied by the best hugs in town? And better still if you knew your eating-out dollars were going to a worthy cause, like supporting a person who has overcome his disability and inspires people to achieve their own dreams? If you’re in Albuquerque, you can have all this at Tim’s Place. Owning Tim’s Place is a dream come true for Tim Harris, a young man with Down Syndrome. As manager of the restaurant, Harris puts into practice what he learned while in college studying food service and restaurant hosting. He also continues a rewarding career that he started while working at many different restaurants during high school, college and after college. 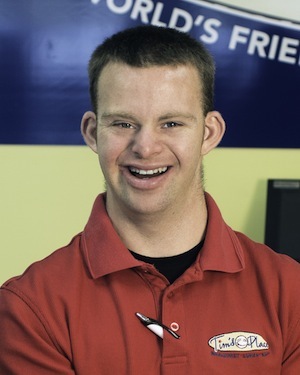 The restaurant also allows him to also give back to the community as an employer and a sponsor of Special Olympics and the National Down Syndrome Congress. For Harris, making the dream a reality began with a loving and supportive family. His abilities were further nurtured in a school that recognized his talents and allowed him to develop in sports as well as academics. Says Harris, “Growing up, I always knew that [my family] loved me just the way I am. My brothers treated me like a brother, not like anyone special.” Tim is the second in a family of four sons. He adds, “My brothers tried to let me do things for myself. Sometimes they let me hang out with them and their friends, but other times they wanted me to hang out with my own friends.” As with any siblings, this kind of close relationship, mixed with times of independence, helped Tim to develop strong interpersonal skills. This close relationship at home bolstered Harris’ confidence and helped contribute to his success in school. Harris attended Eldorado High School in Albuquerque and was graduated in 2004. His enrollment and that of some peers encouraged P.E. teacher Michelle Chavez to add Special Olympics to the curriculum. The Special Olympics team during Harris’ high school career was the Eldorado’s first, Harris relates. He helped make it a success, winning medals in several categories. 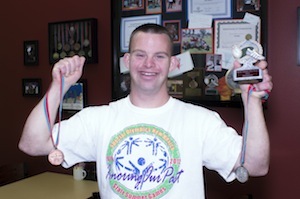 Tim poses proudly with his medals from the 2012 Special Olympics New Mexico Summer Games. Harris’ high school achievements were not limited to the athletic field. He was also named Homecoming King and selected by students, staff and faculty as Student of the Year when he graduated in 2004. He accomplished all this while working after school in a local Red Robin franchise, where he first realized his love of working in the restaurant industry. With help from his dad, Harris found a postsecondary program at Eastern New Mexico University at Roswell that would suit his career goals. “I knew I wanted to be in the restaurant business and chose to study food service and restaurant hosting,” he says. “Eastern New Mexico had a program to help students learn the rules,” he relates. While a student, Harris worked at a variety of local restaurants including CiCi’s Pizza, Golden Corral, IHOP, and Peppers Bar and Grill. Tim (left) posses with Tim’s Place employees. Harris stresses that in order to live on his own, he had to know how to keep a schedule and be on time, but these skills were already familiar to him. He also had to do his own laundry and clean up after himself—which he’d also already done while living at home. He notes that friends of his who did not really want to be in college or who weren’t as prepared to be independent were not as successful. After graduating college in 2008, Harris worked as a host at Applebee’s restaurant in Albuquerque and then, living aboard a sailboat with his parents, he traveled throughout the Bahamas, where he first earned his nickname “Tim the Man.” When the family returned, Harris was ready to work again, and his parents were ready to help finance his employment dream of having his own restaurant. Tim Harris speaking as a Special Olympics Global Messenger. Although at present there are no other people with disabilities working in the restaurant, Harris hopes to hire some in the future. In addition to offering delicious food and free hugs seven days a week, the restaurant also supports Special Olympics of New Mexico and the National Down Syndrome Congress. 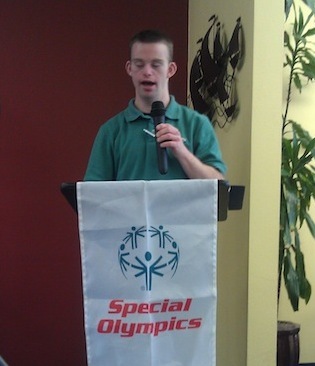 And, when he’s not at the restaurant, Harris is a popular speaker on the topic of achievements for people with disabilities. Anyone who talks to Harris can easily see why people seek out his public-speaking presentations. His positive attitude and desire to help others come through immediately. His love of his family comes through as well. For example, in conversation for this article, Harris was bursting with pride at the fact that his brother had just graduated and became an Albuquerque firefighter. He can be reached through his speaker website, http://timtheman.com. Or you can check out the food, hugs, and positivity on the menu at Tim’s Place. *Poly hockey is adapted from the game of ice hockey. It’s an indoor floor sport that gives athletes who live in warm climates the opportunity to compete in the normally winter sport of hockey. Poly hockey once was, but is no longer, a recognized Special Olympics Incorporated sport as is floor hockey, which is played with wooden sticks (without blades) and pucks that are large felt discs with an open center.